refection of the changng fortunes on the battlefiled is this "Ready to Defend" image of an SS MG 34 crew. Recruiting poster targetting Italians to enlist in the Italian Legion hto cruiting poster aimed at Italians into the Waffen SS. “WELT UND HAUS”…”MEINE EHRE HEISST TREU” -“Abroad and at Home”…”My Honor is True.” Recruiting poster for the Waffen SS with two young SS Men looking off into the distance. My Honor is True was the motto of the SS and that phrase adorned their belt buckles. 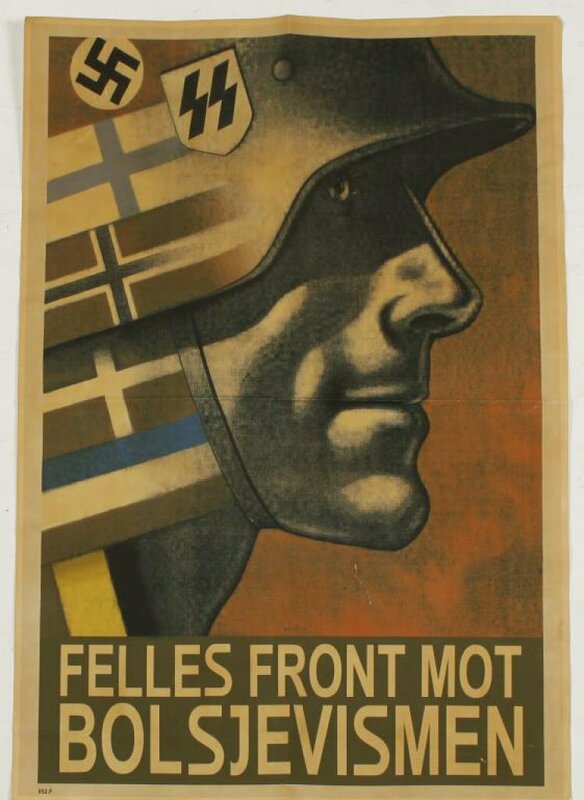 Scandanavian and Baltic flags combined into one soldier with the message in Norwegian "United Front Against Bolshevism." The war against communism was a central and effective recruiting theme for the Waffen SS which fielded several national formations in the war. Recruiting poster for the Leibstandarte Adolph Hitler (LAH), which was the premiere combat unit of the Waffen SS. The LAH began as a motorized regiment and ended the war as the 1st SS Panzer Division, the heaviest and most lethal combat unit that the Germans fielded. It became the German’s most formidable battle formation and had the distinction of being involved in all of the major campaigns of the war. Recruiting poster for Danes in the Waffen SS. "For Denmark Against Bolshevism" The image of a Waffen SS man with a Viking warrior with a Danish flag in the background was a clear message that today the enemy was the Bolshevick of the east much as been the case when the Vikings reigned supreme. German poster designed to win the hearts and minds of the French people after the fall of France in 1940. A German soldier with smiling children and the message that refugees or the “abandoned” should trust the German soldiers to care for them. This was part of the German campaign to lower apprehension of their occupation.